A SOLID COMPANY… WITH A SWEET HEART! Company “Dolciaria Peroni” was founded in the 1977 by the family Peroni. The company was specialied in manufacturing high quality and fresh patisserie products for the Italian gastro industry. After thirtyfive years of traditions, passion and hard work, the third generation owner Mauro Peroni decided to follow his dream, founding the industrial division of Dolciaria Peroni for the Retail industry. Mauro’s dream has always been to be able to sweeten breakfasts and snacks to all children and families from all around the world, sharing his passion for bakeries. Dolciaria Peroni is now a leading company in the Italian Retail industry and it has started exporting in more than 20 countries. Among our specialties are the croissants, mini croissants, vegans croissants, Radeschi, Trecce, and also products without palm oil. Our development department keeps following all the most important conventions of the food industries to keep producing delicious but healty food. Thanks to a constast research of the best ingredientes we continue innovating in order to anticipate the families needs. Our motto is to stick to our traditions and not compromise in quality. Quality, Taste and Freshness are always the focus of our production. 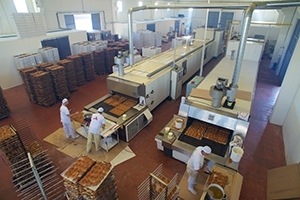 In recent years we have heavily invested in a new factory with modern machines, higly passionated and trained personelle and obtained the most important certifications to ensure the constant quality of our delicatessen. Among article we’re most proud of there are the Croissants. Those products are realized following the traditionally recipes of the Peroni’s family. We use the best ingridentients such assourdough, no hydrogenated fats and natural flavors, to ensure a unique taste and fragrance. We wants to make every breakfast special for this reason we have develped special products for vegans, for people with various food intolerances, products withotu eggs or milk. After the last health discouver we have produced our products withotu the palm oil. We want a Sweet World!